In this fourth installment of the YaleLawTech Fair Use of the Week series, we would like to wish the Digital Millennium Copyright Act (DMCA) a belated tenth birthday. However, our installment this week is about Peanutweeter, a microblog devoted to humorous mashups of tweets and Peanuts comic strips. Tumblr, which hosted Peanutweeter, removed the microblog on June 16, 2011, after a DMCA takedown notice. T. Jason Agnello is the creator of Peanutweeter, which mashed together Peanuts and tweets to create humorous images. In essence, Agnello inserted funny tweets that he found in his browsing of Twitter into the speech bubbles of Peanuts characters. 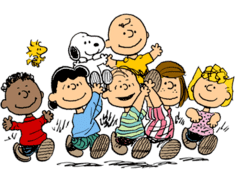 Despite, or perhaps because of, the site’s growing popularity, Iconix Brand Group (Iconix), who owns the copyrights to the Peanuts comic strips and characters, requested that Tumblr remove the blog. Although Agnello believes that he has a good claim to fair use of the Peanuts characters, he feels that he has neither the energy nor the revenue to fight the takedown. In this post, we will look at the DMCA’s notice-takedown-putback provisions. We will also examine Agnello’s fair use claim, and, from this perspective, look back at how the DMCA has affected creativity over the last decade. Section 512(g) of the DMCA requires service providers, like Tumblr, who are engaged in webhosting to adopt, reasonably implement, and inform their users of a policy that provides for the removal of user content when users infringe on another’s copyright. Although a service provider does not need to comply, it would expose itself to liability for copyright infringement. When a company like Tumblr does comply, here’s how the process works. In our example, John represents a mashup artist, and Jane represents the owner of a copyrighted work that John is using in his mashup. John posts a copy of Jane’s work on his Tumblr-hosted website. Jane finds John’s posted copy. Jane notifies Tumblr, via Tumblr’s designated agent, that her work is being infringed upon. a good faith belief that John is using Jane’s copyrighted material without permission; e.g., without fair use. Tumblr takes down John’s content and tells Jane that it did so. John has the option of sending a counter-notification to Tumblr to put back his removed content. John, in his counter-notification, must swear that he has a good faith belief that Tumblr removed or blocked his content by mistake or misidentification. Tumblr must provide the counter-notification to Jane and then wait 10-14 days. If Jane does not respond, Tumblr must put back or unblock John’s material. The most substantial problem that we find is that Iconix’s notice is missing any fair use analysis! A redacted version of Iconix’s notice is provided here. Many courts require that copyright holders conduct a fair use analysis before sending a takedown notice. It is not surprising that Iconix omitted this analysis because, when we balance the fair use factors, we find that they favor Mr. Agnello rather than Iconix. In determining whether or not an artist has a valid claim to fair use, there are four factors that one must balance. If an artist’s particular use of a copyrighted work is fair under these four factors, then the law excuses the artist’s copyright infringement. See a prior post for an explanation of these factors, or visit the U.S. Copyright Office’s website. First Factor: The Purpose and Character of the Use. First we look at the character of the use. In the case of Peanutweeter, we have two different copyrighted works that are mashed up together with comedic effect: Peanuts and tweets. One could argue that the comic mashups are derivative works because they derive from others’ copyrighted material, i.e. Peanuts and tweets. However, Peanutweeter is transformative because it is more than the sum of its copyrighted parts. It imparts new meaning onto both tweets and Peanuts by placing them into new and interesting contexts. Although Peanutweeter is certainly hilarious, we would not call it a typical parody, which courts have regarded as explicitly fair use. Peanutweeter is not mocking or criticizing Peanuts, but sometimes it did poke fun at the Twitter-ers. The fact that Peanutweeter, as a comic mashup, does not fall into any of the common fair use categories, does not make its character less transformative. Next, we look at the purpose of the use. Peanutweeter was not-for-profit. It had no ads on its website, and it did not sell any of the comic mashups. The creator of the site, Jason Agnello has stated, “I made PT for laughs.” Based on the transformative character and not-for-profit purpose of Peanutweeter, the first fair use factor weighs in Agnello’s favor. Second Factor: The Nature of the Copyrighted Work. Agnello used Peanuts and tweets in Peanutweeter. Peanuts comics are copyrighted and for-profit works. Tweets, however, are a different story. People have argued back and forth over whether or not these 140 character blurbs are protected material. In our opinion, tweets are protected under copyright law. If a work is fixed, original, expressive, and non-factual, its length has no bearing on whether or not the work is copyrightable. Tweets are generally brief expressions of literary authorship based on what people post on their blogs. That makes them copyrightable and, in all likelihood, removes them from the public domain. (On the other hand, we think that tweets about facts, ideas, and unoriginal authorship are not copyrightable.) Because Peanuts and tweets are published and, in all likelihood, not in the public domain, this second factor weighs against Peanutweeter. Third Factor: The amount and substantiality of the portion used. Peanutweeter used portions of Peanuts comics and others’ tweets. Regarding the tweets, they were sometimes reproduced in their entirety, which goes against the spirit of fair use. However, these tweets have inherently low quality and convey very little information. Because they are so short, a critic generally needs to reproduce the entirety of the tweet to make a point or produce a comedic effect. Regarding the Peanuts comic strips – the reason why Agnello’s microblog was removed – Agnello used an insubstantial portion of the content. Although he used Peanuts images, which is an important and central aspect to the comics, he used only one panel of what are typically four panel comics. He used none of the text associated with the comics, which gives them humor and context. When taking all this into account, this third factor neither favors nor disfavors Peanutweeter. Fourth Factor: The effect of the use upon the potential market. Peanutweeter was not taking any business away from Iconix Brand Group. It did not create a rival product or a replacement for Peanuts, nor did it decrease the market demand for the tweets. It is unlikely that a rational person would accept a quote from Peanutweeter at face value. Viewed from this perspective, Peanutweeter increased the demand for reading the original tweets and imputed nostalgia for Peanuts. This fourth factor weighs heavily in Peanutweeter’s favor. When balancing all of these factors together, we think that Agnello’s use was fair and that Tumblr erred in taking down Agnello’s blog. However, it is understandable why Agnello does not wish to counter the takedown notice. It is likely that Iconix, a large media conglomerate, will respond by filing a complaint in federal court. It is unlikely that Agnello has the necessary resources to litigate his fair use claim, which is a defense to copyright infringement. The expenses of a drawn-out trial would burden Agnello. Looking back at the last ten years of the DMCA, we can get some perspective on how it has affected content, especially on the internet. Despite that Agnello has a very strong case for fair use, in all likelihood, Peanutweeter will remain gone for good. This result is far too typical. All but the most famous artists are unable to stand against the legal might of the large corporations that own copyright portfolios. Your average artist is unaware of how to deal with a takedown notice. In a case like this one, where an ISP has removed content in response to a DMCA takedown notice, the artist can request that the content be put back up. An artist can even sue because of improper removal. However, for many artists, these takedown notices are intimidating. The DMCA has put too much of the power in copyright disputes into the hands of copyright holders, which has certainly diminished the amount of creative content on the web. One simply has to look at YouTomb to get a perspective on how much content has been removed. On the other hand, the DMCA has allowed ISPs, like Youtube and Tumblr, to flourish. By immunizing them from copyright infringement when they comply with the notice-takedown-putback regime, the DMCA has given these content providers a great deal of freedom. These providers can allow users to post content without first inspecting and approving it. This means that providers don’t need to expend constant resources scanning for potential infringement. At the moment, the DMCA’s effect has been mostly negative. When copyright holders exercise their rights under the DMCA, content providers have more incentive to remove potentially infringing content than determine the correctness of a takedown notice. The net result is to quash creativity. Perhaps in the next decade, we will find generative versions of the DMCA that better promote creativity while still protecting the rights of authors. Excellent and simple explanation of Fair Use and the ‘notice-takedown-putback’ process. The fair use analysis is well-reasoned and beautifully put. Well done!